After seeing Glyn Hodges at Manchester City, it was off to Alderley Edge, the capital of footballers’ wives country, to battle the traffic calming measures with the 4x4s. I was due to meet Steve Harrison at a little tea shop. Steve joined Watford in 1978, shortly after the club’s promotion to Division Three and he spent quite a bit of his time battling with Keith Pritchett for the left-back slot. After leaving for Charlton Athletic as a player, he applied for a coaching job at Watford. Although he lost out to John Ward for the job advertised, Graham Taylor offered him a role working with the club’s juniors. 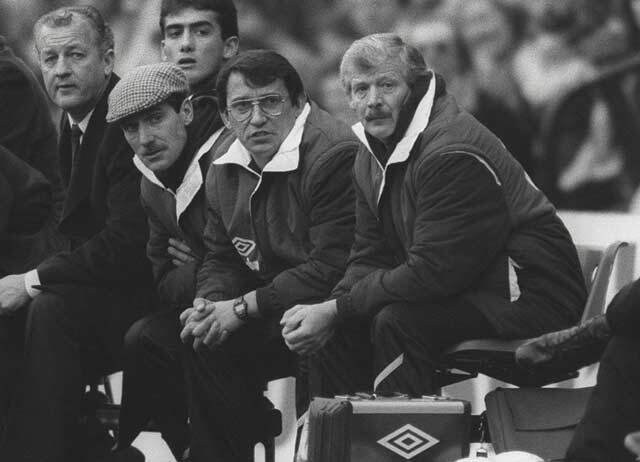 He then became an integral part of the coaching set-up and when Taylor left to join Aston Villa ‘Harry’ went with him, returning to replace Dave Bassett as manager six months later and enduring what he says himself was a lonely, unhappy spell in charge. Steve was great company. He asked the tea shop owner if she could turn the music down because I was recording our conversation and then he spoke at length with the humour and enthusiasm I’d hoped for. So, I’ve started most of the interviews by asking how people came to join Watford and be a part of this amazing journey, so what’s your story? I knew Dennis Booth very well and I was coming back from Vancouver Whitecaps. This was in 1978. He rang me and asked if I would sign for Watford? It’s a good club on the move, he said. We used to play for Blackpool and were good friends, but I’d already had a thought about going back to Blackpool. I’d played all my career at Blackpool, then the chance to Canada came up when they were expanding football in North America, or soccer as they called it. But I was 26 and I was in the prime of my career, if you can call it that [Laughs] and I wanted to come back to England. The standard in Canada was alright but I knew it was only a temporary thing going over there. Anyway, Bertie Mee rang me and I said I’d come down and talk. Bertie Mee, calling me? Incredible really, when you think about it. I hadn’t got a car, so I borrowed a car from someone and it broke down around Keele and I had to get it back to Blackpool, and I came down to Watford the next day on the train. I had arranged to meet Graham at the station at 1.30pm. That’s it. I didn’t realise that he was sitting in the car watching me outside the station. Crafty, crafty. He was watching what I did, weighing me up. I didn’t know he was doing that. As far as I was concerned he was late or hadn’t turned up so used the payphone and I rang the club and they said oh he’s there. He’s in his car. He’ll come and find you in a minute. So Bertie Mee and Graham took me to lunch, just a sandwich in the café at Watford Junction. No glamour but with Bertie Mee, a double-winning man. A legendary manager, having a fried egg sandwich with me talking football. They showed me the training ground at Shendish. It was freezing up there, always was. I signed and I got in the side and I was doing okay. Then I had a bit of a dip and he left me out and for the rest of that season me and Keith Pritchett shared it. That was 1978-79, the season you won promotion from the Third Division. That’s it. At Blackpool we’d been in the Second Division so I suppose I thought I’d be alright down at Watford, a division lower, but we were going for promotion and Graham always liked two players in each position if he could because it made you push hard to get a shirt and keep it. When we got into the Second Division I established myself a bit and had a good season. I was third prize in the player of the year competition and I got myself a nice bit of Wedgwood. What did you think of Watford in that first year or so? The training was so different. He absolutely belted us and it took me about four weeks to get used to the training. It was very intense. I was used to running on the beach at Blackpool and that could be hard but this was another level. He was a different man. Completely different to everyone I’d worked with before and since. His methods were very, very simple, very precise, very concise. There was a lot of methodology that went into his training but he kept that hidden from the players so for us it was never complicated. Simplicity is a hard thing. It takes a lot of work. He was unpredictable in a way. He’d work us so hard and then one day we’d be sort of worrying about what he was going to have us do and he’d send us all home at 11 o’clock and tell us to have lunch with the wife or have a relaxing afternoon in the garden. Days like that gave you such a spring in your step. I’ve heard all about your reputation as a joker. Were you always like that? I was. I think you have to enjoy your work to be good at it. Think about it – when you’re smiling how much easier everything feels. When you go round frowning everything feels like a chore. I wanted to have a laugh and a joke because I thought it was good for us not to take it too seriously all the time. He didn’t like me messing about in training too much sometimes. He would let me know if I overstepped the mark. ‘Right, that’s enough,’ but I knew what I was doing. If he said enough, that was it, I knew it was back to work straight away, no messing. So you respected him even though you didn’t know him very well at the beginning? He had a presence, an aura. He still has now. You feel your shoulders straighten up when you’re with him. You make sure your shoes are shined. He can cut you down with a look, not in a nasty way, but if you had scuffed shoes on he’d notice and he’d let you know he’d noticed without saying anything. He was a great manager, and he’d still be a great manager now but I think the game changed and he wasn’t prepared to compromise. But for as long as I knew him, he drove everything, you know. He did everything. He chose the curtains in his office, everything. He gave us a little room at the ground for the players to sit in and we decorated it and that was our space and he didn’t come in there too often. He built that club and he made us want to put as much into it as he did. You obviously joined up with your old mate Dennis Booth when you joined. Did that make it easy to settle? You had a couple of full seasons in the team in the Second Division. Kenny Jackett took my place. He was my apprentice, cleaned my boots and then he was in the team. Was he a tough boss, Graham? He was, of course, but in a good way. Demanding. He demanded the best from himself and the best from those around him. But he was consistent and you want that in a boss. He would say his piece and then that would be it. He wouldn’t sulk. He’d say it and then move on. Sometimes he’d make a bit of a joke but he’d draw a line under it and move on. He’d give us a look every now and then, Boothy and I, because we did joke about. Pat had a reliant robin, like Del Boy [from Only Fools and Horses]. One day we lifted it up and carried it on the centre circle at Vicarage Road. He was asking ‘Where have I left my car?’ We were cracking up. He was a tough man. He’d been a show boxer at the fairground, you know, in the booth taking on all comers, you know? He stood for no nonsense Pat. One day he was driving me and Roger Joslyn into town in his car. We were stopped at the lights in Clarendon Road. Two or three young lads were walking across the road and they slapped the roof. Pat got out and ran after them. He took the keys with him, so we had to pick up his car and put it on the pavement until he came back. What do you think it was about you that persuaded Graham to offer you a coaching job? How did it come about? I had to go away to come back, not that I knew I was going to come back when I left. I knew my knee was a problem and he was looking up the divisions not down. Graham never called me Harry like everyone else, never ever. I was always Steve, or Steven if he was really annoyed. I knew it was coming. I didn’t want to admit it and I didn’t want to come to that realisation but I knew I wasn’t going to be good enough for him to push on. But I wanted to go on good terms. I said, ‘I’ve right enjoyed it.’ I had a bit of a dip in form at one point. I had been captain of his side, which meant the world, it really did. Then Pat Rice came in and was captain and that was a great decision. Well, I went to Charlton Athletic and played about three games and finished, so he was dead right about me. I was done. After that meeting with Graham I went out onto the pitch at Vicarage Road to reminisce and think about the three years I’d had because I right enjoyed it. I looked all around the ground and when I turned to have a look, I saw him watching me out of his office window. I enjoyed Charlton but I was knackered. My knee was shot. I was a bit naughty really because Alan Mullery gave me a two-year contract and he was very good to me and I knew I probably wouldn’t make it. But I when I knew I couldn’t play I went back to Alan and said, look, I’ve got this contract for two years and you’ve been good enough to offer it but we both know I can’t play so I will do the training in the morning and then I’ll take the kids in the afternoon and I’ll do the reserve team for you to make amends. We won the midweek league and I enjoyed it, coaching, trying to make a player better here or there. I went back to Alan Mullery and I still had a year left on my contract but I told him I’d been offered a job at Watford. He gave me a settlement on my contract, which I didn’t ask for, and that was very good of him. 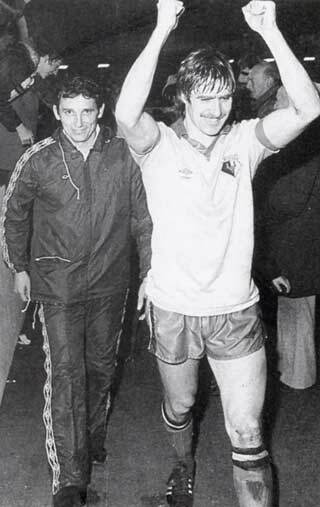 I went to Watford in March 1982 when Tom won the FA Youth Cup. I came in and we won the youth cup and I kept a low profile. I was careful not to take any credit whatsoever for that because it was Tom’s team and he’d put years into building that youth set-up. But I was happy to get stuck in and do whatever Tom wanted me to do. Drive the van, pick the lads up for training, drop them off. It was hard work compared to playing. Monday night, Tuesday night, every night of the week training different age groups. And you’d have to go and collect lads. I used to go to Chigwell to collect Dean and Dave Holdsworth. Then there were matches on Saturday, under-15s on Sunday on the field where the girls’ school is. It was full-on, seven days a week. Tom gave me the under-15s. When the lads came over at Easter for a couple of week’s training during their school holidays you had to sort out the digs. You had to contact the landladies and say, ‘Can you put up Little Jimmy from Leeds for a week?’ You had to pick them up and drop them off and make sure they were okay. I absolutely loved it. You see a good young player and think they have a chance and then you work on them, try to help them realise their potential. I must have done a couple of years with Tom and he taught me an awful lot about individual coaching. He taught me the ins and outs of the one-on-one coaching. It’s different to coaching a group but it’s where you make the biggest difference. He said, ‘Get inside their heads, Harry.’ One to one there’s no embarrassment, like there is in a group. No one else is listening in hearing what they’re not good at or what they are good at. You could talk to them about every aspect of their game. We used to tape Match of the Day and show them little things and you could really give them a lot of very intensive work and it was so rewarding when you see them do something in a game and you think, ‘I showed him how to do that.’ Tom taught me how to deal with people individually. You have to work out what works for each person. So, for a defender you might come up with something simple to teach them to face up to their opponent. ‘Don’t let them see your number, you know, the number on your shirt.’ A stronger image than saying, ‘Don’t turn your back.’ More effective. I had learned a lot about forward play from Graham. I loved working with defenders and I still think it’s a sadly neglected area of play. People say, ‘Well, he’s a good defender, but…’ There’s no ‘but’ about it. A good defender is a good defender. To me, defending is an art. I say to them, ‘Your craft is equally important as scoring goals.’ Don’t say, ‘Well, I can defend,’ when asked what you can do in a game. That’s the most important part of being a defender. It’s something to be proud of. I remember an anecdote about Tony Adams and George Graham. Tony had apparently said to him that he fancied playing the ball out of defence, coming out with it and passing. He thought he could play a bit more. George said to him, ‘Oh do you now big man. Well, I want you to keep heading the ball 30 yards, keep kicking it into row Z and keep picking up those medals.’ Good defending is fundamental and good defending starts so many attacking moves. John Ward described himself as the straight man to your comedian. Do you think that was something Graham did deliberately? I think so. When you look at his staff, John was a forward, the straight man. Tom was older, a midfielder, the disciplinarian, I was a defender and the joker. So I think you’re exactly right. It was a perfect team. Wardy was a calm person, very straight. He had a great sense of humour but he was very dry and he saved his one-liners for the right moment. I was more visual. If the lads were tense, I’d do something stupid. I’d walk into the door, or I’d come into dinner a bit later and slip on the floor and roll about. I loved visual humour, the Marx brothers, Laurel and Hardy, Morecambe and Wise. I hated humour where you hurt someone. I never took the mickey out of someone when they weren’t there. I’d do it while they were there. [Laughs] What I mean by that is the jokes were not at someone else’s expense in a way that singled them out and made them separate from the group. I might rib someone but it would be inclusive. It’s a fine line that but I never picked on people. We had some laughs though. I remember Cally’s dog wouldn’t let him in his car once. I had to hold the dog back with a big net so he could get in the car. When GT brought me in, there wasn’t really a job for me to be honest. I could sense he just wanted me in the club. He sort of created something for me to do really. Tom was fantastic. I used to warn the young lads not to laugh at him, though. He would snap if he thought you were taking the mickey. You couldn’t get away with the language Tom used with kids now but that’s how it was. He used to strike the fear of God into ’em. He’d get his words out wrong sometimes and I remember him saying once to someone, ‘Any more of this and I’ll knock your shoulders of your head.’ I was there trying not to laugh. He was fantastic, Tom. We were coming from an under-16 game at Woodside, in the van and he’s talking away. ‘This lad, 14 years old, he’ll play for England, I tell you. He wants to come, but it’s the mother. She wants him to go to Arsenal. She’s the eye in the ointment.’ The lads were sniggering in the back and I looked round and gave them a look warning them not to laugh. How did you come to move up from the juniors to the reserves? Tom gave me some nice responsibilities and I enjoyed it. Then GT moved Wardy up from reserve to first team coach and I went up to the reserves. Then he made Wardy assistant manager and me first team coach. He left Tom with the kids because Tom was brilliant at it. I’d done all my badges so I was a fully qualified coach. So when the team got to the FA Cup final you were around the first team? As a comedian, what did you make of Michael Barrymore’s turn at the team hotel before the game? Wasn’t for me that. He tried his best but he didn’t really go down a bomb. I think he took the mickey a bit and tried to show them up a bit and I didn’t like that. He didn’t spoil anything but it wasn’t for me that. What else did you do other than the coaching? I remember going to watch Maurice Johnston at Partick Thistle. I wasn’t sure about him because I didn’t think he had the discipline in him – on the pitch I mean. Did he work enough for us? I went into this pub, because I was dead early. The Wee Mill pub. It was a drinking den, you couldn’t see through the windows. I walked in, looking like an insurance salesman. I thought ‘Oh dear.’ Everyone looked at me. I watched the game, I went back to the pub to order a taxi. Anyway, they bought me a few drinks and I started worrying about this flight so I asked if I could use the phone, ring a taxi. Someone said they’d drive me back to the airport, so I got in this Ford Anglia van owned by some builder and he was more pissed than me. There was no front seat, so I was in the back, sitting on a bag of plaster, and with tools and everything sliding about. I was covered in plaster dust. I tried to give the guy a fiver or whatever and he said, ‘Oh next time you’re in the Wee Mill buy me a pint.’ When I got back I wrote to the Wee Mill landlord and said thanks and what have you. What did you tell Graham about him? He was a handful on the pitch and even more of one off the pitch but I have to say this, we never had a problem with Maurice in terms of him playing. You could tell he was just going to be passing through at Watford. We held him up in a cold shower. Tom said, ‘Don’t say anything to the top man.’ We never said a word. We got in through the training session. He was crap but he was going through the motions. We had to drive him back to his little flat. Then we went back in and saw the gaffer. ‘Training go okay did it?’ he asked. He didn’t miss a thing, Graham. Graham handled Maurice so well. It was a lesson to me. Maurice was a lovely lad. You simply couldn’t fall out with him, no matter what he’d done. He had a cheeky smile. He was different to every other player at Watford because he was a crap trainer, until it came to shooting practice, but you couldn’t argue with his ability. You could say, ‘Come on Maurice, you’ve got to put more into training here than this,’ but there was no point. He’d say, ‘Don’t worry, Harry, I’ll be right on Saturday.’ And he was. He scored a lot of goals. So before the corner or free-kick or whatever it was we were practicing, Maurice went and stood in front of the keeper then peeled away and when it got flicked on he was there, free, to stab the ball into the net at the back post. ‘I don’t know.’ Maurice didn’t know. I mean, he did know, but he couldn’t talk you through it and he didn’t plan it. He was just instinctive about it. He used to score so many like that. The thing is, that tells me about the genius of Graham Taylor. A man who planned every corner and free-kick and worked on them for hours because he knew what a high percentage of goals came from them yet he saw a player like Maurice and he kept his hands off. He didn’t try to fit Maurice into a little box and tell him what to do. That’s Graham recognising the player and realising it was pointless giving him a role, he wouldn’t have done it, because he wouldn’t have thought about it, he’d just go where he goes and it works. It was incredible really and I remember that because it opened my eyes a lot about how to work with players and people. The hard work on the training ground reaped rewards but did you feel it was a one-dimensional, rigid style of play? There were times when it had to be. No matter how good you are, when you are getting out of defence and want to get up the pitch quickly if everyone knows where their team-mates are going to be it helps a lot. We did get it forward but to score goals you have to pass it to your team-mate, you have to know where they will be and deliver the ball with quality and timing. I remember when we bought Kevin Richardson I thought Graham was trying to change it. I went to watch Richardson and I liked him a lot. A lovely footballer. Calm, good on the ball. I said he might not do us because he likes to get the ball of the defenders and he likes to switch the play. I was watching him play and thinking that some of the stuff he did might drive Graham mad but the thing was he was clever. We used to like to get the ball and hit the centre forward and then it’d come back into midfield and someone would then be looking for the third man running. Well, I watched him play and he got the ball and he turned on it and played it sideways to the full back who then found a bit of space a threaded a ball through. Nice stuff but not what we were doing. Well we might need an extra pass. We might need to change the direction of play a bit. That was fantastic and that’s what he did for us. He was tremendous. And that was Graham evolving his style as teams got to know us and started to cope with us a bit. It’s interesting isn’t it, when you look at the league table, the season we had Kevin Richardson in midfield and [Mark] Falco up front, who was big and strong but also liked to pass it, we had the second best finish we ever had. [Ninth in 1986-87]. But it was a gradual process to get to that point. Graham kept changing the team, moving things on, getting better players. Who else sticks in your memory? I remember when Gerry Armstrong came in. Lovely fella. I remember when he first came in, he was wearing these shorts and they had that little pocket inside the lining and he had his keys and some change in that pocket. We were running round and his change was jingling with every step. I said to Pat Rice as we were running, ‘Oh dear, have a look at the gaffer’s jugular.’ The vein in Graham’s neck was going like this. [Makes pulsing motion with his hand]. Gerry says, in his Northern Irish brogue, ‘Lovely day for training this, Graham.’ I said to Pat, ‘Oh no, now he’s called him Graham. Oh this is going to be good.’ Steam was coming out of the gaffer’s ears. ‘Right, well let’s get on with it then.’ The rest of us were cracking up. He was so good for morale, Gerry. You could leave him out of the team and he’d still be upbeat and happy. So positive and so confident it just rubbed off on people. ‘Well, gaffer, if that shot had been on target, I might have scored.’ And that was his mentality. He was great. I played with John Barnes in his first reserve game. It was a Tuesday night, pouring down with rain, Midweek League, against Northampton or somebody. Gaffer’s not there. There’s a knock on the door and this skinny lad, lovely fresh face, big open smile was there. He knocked on the door. I opened the door and said, ‘Alright son, are you here for the match?’ He had his boots in his hand and his towel over his arm as if he was off swimming, you know. I was playing left back and he was in front of me. He didn’t do much in the game but he was neat and tidy and I remember I played the ball forward to him, and it wasn’t a great pass, you know, might as well have fired it out of a cannon at him, but he took it on his chest and his knee and had it under control in two touches, and I thought ‘Hmm’. We said, okay. He took it and it curled over the wall and hit the top of the crossbar. Graham’s in the ground now. He’s come down from the director’s box. There’s a load of scouts following him. ‘Get him off, get him off.’ Sam [Ellis] says, ‘He’s not done that bad.’ Graham said, ‘Get him off.’ And he substituted him and signed him later that night. Got his dad in and they thrashed out the deal. What a good player. What a bit of luck, really, that we got him but that was down to Graham and Bertie because they were honest, genuine people and John’s dad was going to go back to Jamaica and he wanted to make sure his lad was okay. Were there any players you watched who you came close to signing but didn’t? We went to look at Warren Aspinall. He was quick, had good movement, he was a worker. He was a bit of a lad off the field, I think, but Graham had handled Maurice so that wasn’t a problem. But he went to Everton instead. He was a good player an he later came to Villa with us, but he wasn’t really Graham’s cup of tea. A bit of a loose cannon. Was scouting something you enjoyed? It was. I liked watching a match and looking for something, whether it was watching a player or watching the opposition. They gave me a team sheet and it had all the cyrillic letters on it and I couldn’t understand a word. They gave me a few powerful shots of the local spirit as well and so when I reported back I said, ‘Well, gaffer, all I can tell you is the blond lad and the fella at the back are both good players.’ No, seriously, they were a good side as they proved when we played them. I’m interested in what happened at the end of Graham’s time at Watford. The 1987 FA Cup semi-final against Tottenham intrigues me and everyone has a different take on it. What do you remember? Oh dear that was a disaster. We were staying at Lilleshall. We were staying at a hotel there and training and at the end of a session we were doing some crossing and shooting and he [Steve Sherwood] caught his finger. I tried to get it back in. Steve said he could have played. It was a gamble that didn’t pay off really but we didn’t really give a decent account of ourselves. It wasn’t our day, was it. Graham was very upset about that. I think it felt like it soured things a bit for him for a while. I try not to bring it up too often. It’s not one of those where you can look back and laugh at it and say, ‘Well, we tried it but it didn’t work.’ I think it still hurts him a bit that one. But Graham didn’t dwell on things. He got on with it. Did you pick up the vibe that he was going to leave? I do remember after the semi-final the mood was a bit somber round the place. Although Tottenham had been a good side I think we all felt it was a great opportunity missed. I remember Graham missed training for two days in a row and that was unusual. He wasn’t ill, he just didn’t come in for a couple of days and we got on with it. There’d been stuff in the papers before about clubs wanting him but he always brushed it off but there was something about it this time that felt different. I picked up a bit of gossip on the grapevine and although I didn’t know for sure what was going on I said to him, ‘If you are going to go, I want to know about it.’ He shrugged it off but it wasn’t very convincing so I thought something was up. This was right at the end, after the end of the season, but only just after the last game. Maybe the next day, I can’t remember. Did it surprise you he was going to Villa, who had just been relegated? Yes, I thought he would go to a big team in the top division but Villa was a big club. He’d done 10 years at Watford, he’d done more than his stint and I think he needed a fresh challenge. Villa was perfect really because it was such a mess but it was a risk. If he’d not got them promoted the first year would he have got the sack? You never know. It didn’t occur to you to stay at Watford and see if they offered you the manager’s job? After all, you were back again in about six months. I didn’t want to hang around and do the top job. I didn’t think I wanted to be a manager. I was a coach and I knew what I was and was happy with that, happy to be going with Graham. And yet when Watford approached you, you left Villa? Yeah. I always regret leaving Graham like that at Villa. Around Christmas  I had contact from Watford and I said to Graham, ‘If something comes of it, I’d like to go down and talk to them.’ As it happened, Graham wasn’t very happy about that and I understand that. We had got it right at Villa after a sticky start and we were flying towards promotion. He didn’t want me buggering off halfway through the season but there was something about going back to Watford, about being a manager… could I do it? But it wasn’t the right decision really. I had always been the light-hearted one and now to go back and manage, well, it wasn’t right for me. Watford were in a bit of a mess too. They were. I got it all wrong, really. I upset Graham, I left Villa when they were going well, I came back to Watford and I fell out with Dave Bassett, who they’d just sacked, by saying certain things off the top of my head that I shouldn’t have said because they weren’t the right things to say. You live and learn but I would like to be able to correct a few of those things. It was miserable coming in to a team that was struggling and going to get relegated. Half the squad was different to what I’d left. I don’t think anyone believed they could get themselves out of it, even if the league table didn’t look all that bad. It wasn’t like we were down without hope but some of the lads were raw and inexperienced. But I do really regret talking off the top of my head and I imagine Dave was very hurt by that and I do regret that and I do apologise to him for that. Oh, stuff about them not being fit enough when I arrived. Stupid stuff really. I was making excuses really. I was inexperienced too – I was only 34 and I wasn’t ready for it. They weren’t unfit. Okay, they might not have been as super-fit as Graham would have had them but it was a stupid thing to say. What was it about the manager’s job you struggled with? I didn’t enjoy it, I didn’t enjoy one moment of it. Simple as that really. It was very isolating. I was on my own a lot of the time, just with me thoughts. I wasn’t like Graham. I didn’t bounce stuff off people. I think I thought I had to be serious and so I wasn’t being meself. And in order to appear serious I became withdrawn. I moved Tom [Walley] up [to coach] and I don’t think he was that happy either. He worked his backside off and he was very, very loyal but he was happier working with young players. And he could see I wasn’t happy and I probably wasn’t letting him help me as much as I should have. I couldn’t come to terms with it. Being a manager is like white collar work, being a coach is blue collar work. And I loved being a coach, working with the players. I knew I was good at that. I could gain the trust of players as a coach and I could get the best out of them. But I had to talk to them differently as manager. I made too many mistakes as well. I made a mistake letting Wilf [Rostron] go. He was coming to the end of his contract and would have been going on a free, but I tried to get him a settlement when he left but it was not enough of a settlement considering the service he’d given the club. And I expect he left feeling a little bit sour at me. I hated it, I hated that side of it. Negotiating contracts, money, all that talk. You’re telling someone like Wilf you don’t want him when he’s given so much to the club. And you’re then haggling over the money. Oh it was awful. I couldn’t do things as cleanly as I’d like. I wasn’t clinical like Graham. Graham did care what people thought of him, of course he did, but when he let people go he didn’t let friendship or emotion get into it. I think back to how he let me go. He called the meeting and he just said it straight. ‘This is not a happy day for me, but I’m letting you go.’ I didn’t want to be sour with players but you had to have that distance and sense of authority and I am just not like that. And then on the other hand I found myself making unpopular decisions almost to prove a point that I was in charge. I felt I lost the trust of players a bit as well and I didn’t like that. When they don’t trust you, it’s over isn’t it. They don’t have to like you but they have to trust you. Maybe that was my problem, I wanted them to like me. It sounds quite hard to confront your shortcomings like this. You can’t hide from it, can you. If you’re no good at something that’s not the end of the world. But I regret not being mature enough to try it my way. Now, my way might not have worked either, in fact I’m sure it wouldn’t. The reason Graham was so successful was because of the type of person he was. But my mistake was I was trying to be like Graham. Bertie Mee said I had to be myself and do it my way. I thought management was how Graham did it because as far as I was concerned that was the way to do it. What was your relationship with Elton like? He’d been trying to sell the club just before you came back. The chairman was great. I don’t know what was going on behind the scenes but he backed me. He gave me money when I came in to try to save ourselves but I was maybe a bit rash buying the players I did in Division One, that was a bit of a mistake. The chairman had backed me but one or two were hasty decisions perhaps. I made a mistake with [Stuart] Rimmer, the lad from Chester [Striker] but we sold him on for the same money so that was okay. In the summer, having gone down, I thought I bought well. We’d brought in [Rick] Holden, who was terrific. [Paul] Wilkinson, excellent and we did well to get him. I thought if we started well we could have a good go at it and I thought that first full season was okay. Wilkinson was a great signing. How did you get him? It was the end of the season and we’d gone down. I rang Forest about Wilkinson, because he was a good player. I’d watched him when I was at Watford when he was playing for Grimsby and I think Graham would have taken him but we missed out because he went to Everton. He was at Forest but I rang Colin Harvey, Everton’s manager, and said, ‘I like him but why did you sell him?’ He said he was good but not quite that top level they needed ’cos they were looking at the top six. It was May, the season had just ended, and I rang Forest and spoke to Ronnie Fenton, their coach, about him. Ronnie said, ‘Sorry you’ve gone down but you know, you can bounce back next season. Anyway, what can I do for you.’ ‘Well, I’m interested in Paul Wilkinson, any chance I can talk to the top man about it,’ meaning Brian Clough. Oh, right, here we go! So I’m on red alert. The line goes silent. I thought he’d gone. A bit later I got a call from someone else at the club and he said Clough said we could have him for 250, but he wants £5,000 for the Cala Millor [holiday] fund. In the end we paid the 300. You missed out in the play-offs to Blackburn that season, despite not losing either game. Yeah, I think we ran out of steam at the end. It was a long season. If you look at it, I think we played about 12 games in the first six weeks of the year  and about six of them were in the cup. We played Newcastle four times in the FA Cup because it kept getting drawn and going to extra time. [Between January 7 and Feb 19 Watford played 11 games, seven of them cup ties]. We had a great run in the Second Division and we were really well up there all season. We knew we’d get injuries but we had some really bad injuries to key players. We went out after two draws in the play-offs, which was so disappointing. We didn’t even lose it. We played well at Blackburn. We didn’t deserve to go out. They were tense games. Rod Thomas missed a great chance right near the end at the far post and we went out because they had the goal. Did you have any more positive thoughts about management? Not really. I felt I had bought well, and we had a good go at it but if I’d been honest with myself and if I’d been courageous enough I should have said to the chairman at the end of that season that it wasn’t for me. I sold Tim Sherwood, which was the wrong decision. I regret that. I didn’t handle that situation well either. I couldn’t handle players who wanted to be in the team and I wanted to put them in slowly. I couldn’t handle their disappointment. If I was a coach I could say ‘just knuckle down and keep working’ but as a manager it doesn’t mean the same thing because the player knows it’s you who’s leaving them out. He doesn’t take that as encouragement because you’re the man picking the team, rather than being a coach and an ear to have a bit of a moan at. I handled things wrong. I mean, by the end I didn’t even like myself. I’d lost the respect of myself. I knew I was unhappy. I didn’t want to let Bertie and the chairman down because they were so supportive but it just wasn’t for me. I think if we could have got promoted that first year and I’d been back in the First Division, we might have got things going but maybe that’s wishful thinking on my part. The injuries and everything, it’s so hard to take it in your stride. You plan for something then a key player is out and all that work feels wasted. As a manager you have to be more flexible than that. [Glyn] Hodges broke a bone in his foot. He was flying at the start and losing him was a big blow, you know. But Graham taught me a lot about how to cope with that because injuries are all part and parcel of the game and you have to adapt. It’s just that when I was under pressure I did dwell on the wrong things. I remember one time with Graham, we’d been preparing for a game and Cally [Nigel Callaghan] went down with a hamstring. We all had a meeting in the staff room, cups of tea and a big aluminium tin of custard creams on the table. He was all agitated. Graham was calm, quiet. He said slowly, ‘Well… somebody else, Tom. Somebody else. Now pass me the custard creams.’ That was a great lesson. What else do you remember from your time at Watford? The laughs, really. It was hard work and I was pushing myself all the time because I was playing the game the way Graham wanted it and some of that was new to me, then I was coaching and learning about how to work with people, particularly young people. I learned from everyone. But it’s the laughs I remember most. You do, don’t you. If something is fun, it sticks in the mind. Pat [Molloy] hated people going in his physio room without knocking. He’d say, ‘Get out of my room!’ And he’d chase you out. So he wanted to stop people coming in. Anyway, one day he was there with this saw and he cut his physio door in half so it was like a stable door, and he bolted the bottom half, so you could open the top bit and say hello but you couldn’t get in his room. ‘Ah that’ll show you lot!’ Brilliant.